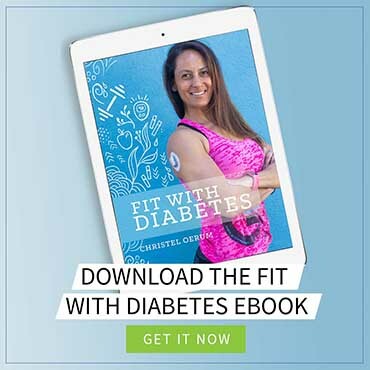 This post is for all my diabetes peeps (and other low carb lovers) who don’t want to give up the sweet and spicy life to avoid crazy blood sugar spikes. 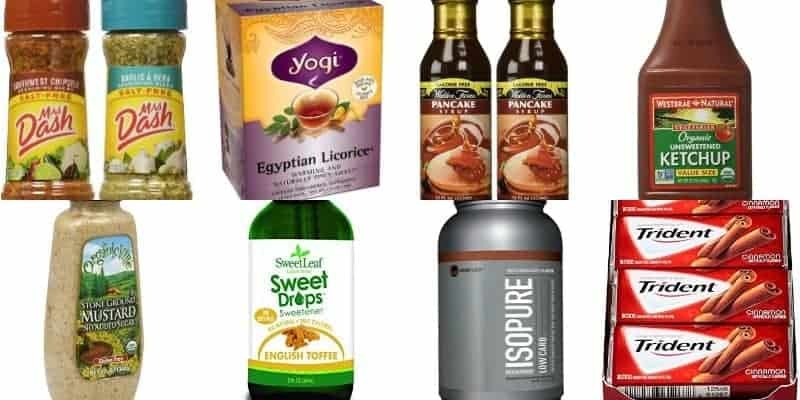 If you know where to look, there are plenty of products that can satisfy your sweet tooth or add some kick to your food, without adding calories or carbs. But if you don’t choose carefully, you might get stuck in sugar traps, or accidentally add loads of calories. This is a list of low carb, healthy products that I use myself and love! Walden Farm sugar-free syrup is pure magic in a bottle. It has absolutely no calories, it won’t impact your blood sugar (I’ve tested it intensively), and it actually tastes like the real deal. It’s not as thick as real syrup, but it’s not watery either. I pour this low carb syrup over my protein pancakes or on my oatmeal and it just takes it to another level. They have many other products, but this is the only one I really like (stay away from their Marshmallow, Chocolate & Caramel Dip. Not good!). Did you know that protein powder is excellent for baking? I use it to add protein and flavor to a lot of my baked breakfasts and snacks (like Protein Pancakes and Protein Berry Crumble) or just mix it in my oatmeal. For baking, I prefer Met-RX Vanilla Protein. It has a great sweetness and vanilla flavor, and it keeps it’s consistency when heated. For everything else, Isopure’s Dutch Chocolate is my go-to protein powder, and I could eat this stuff all day long. It has 1.5 g carbs and 25 g protein per scoop, so the macros are really good. It’s one of the more expensive protein powders, but that’s because it’s good quality. It’s a protein isolate, meaning it’s pure enough to be lactose-free so it can be tolerated by most people. The only thing it isn’t good for is baking, as it has the wrong consistency. If you have read my post on “The Best Sweeteners for People with Diabetes” or just looked at any of my recipes, you’ll know that I’m a big fan of Stevia . I use it for baking, on my oats, in my coffee, you name it. It’s hands down my favorite no-calorie no-carb sweetener. I like that it’s a natural product and won’t make me bloated like many of the sugar alcohols. I only just recently discovered Stevia Drops, and oh my, I’ve been missing out! You already know I like Stevia, but these take it to another level. It’s liquid flavored stevia extract. Yep, Stevia on steroids. 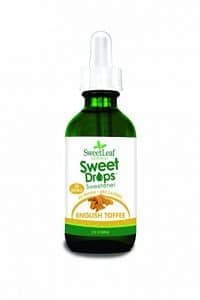 I buy the Sweet Leaf Sweet Drops and have fallen in love with the English Toffee and the vanilla cream flavors. I usually prefer black coffee, but a few drops of these in my coffee really curbs any cravings. And then a few days ago I came across their Waterdrops. I’ve only tried the Strawberry Kiwi so far, but it’s good. Really good! You just squirt a few drops in a glass of water and it adds a ton of flavor. This is a great product if you are trying to cut back on carbonated drinks and want to drink more water. Spice mixes are a fantastic low carb way to add flavor to food without adding calories or affecting your blood sugar. You can even get mixes without salt if you are looking to cut back on your sodium intake. My favorite spice mixes are the Ms. Dash products. They come in pretty much every flavor and don’t contain sugars or salt. You can, of course, make your own spice mixes or choose another brand, just read the ingredient list carefully so you don’t end up with a sugar rub. Tea is a brilliant way to get a no calorie treat. Yes, I said treat. Imagine snuggling up on the couch with a book and a hot drink — that’s a treat. 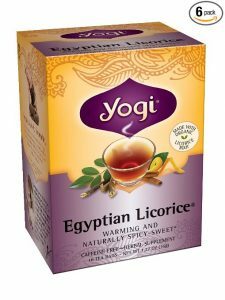 I really like the Yogi flavored teas, particularly the Egyptian licorice. It’s caffeine free so I’ll usually have a cup or two before bed, and it’s a great way to wind down and finish the day. I really like chewing gum, but I try not to have it too often since most gums are sweetened with sugar alcohols and will make me really bloated. If you are a stress eater or trying to manage cravings, chewing gum can be a good way to add a little sweetness and keep your jaw muscles occupied. I have a “thing” for Cobalt gum or, if I’m feeling the need for some intense flavors, I’ll go for the Trident Cinnamon. Bring out the mustard, ketchup, and hot sauce! If you choose the right products, condiments can be a great way to boost the flavor of your meals. Regular ketchup can be a sugar trap, so I buy the low carb unsweetened ketchup from Westbrae. A teaspoon has 1 g of carbs, which I pretty much consider no carbs. 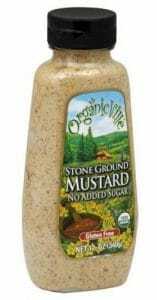 I’m also a total mustard addict, and I’ll always have a small stash of no-sugar-added mustard (like the Stone ground or Dijon mustard from Organicville) in the house. Of course, none of this should ever replace or in any way substitute real food or good nutrition. I see these products as nice additions to an already healthy lifestyle. They just make food (and life) a little more enjoyable! What healthy or low carb products do you use to add a kick of flavor to your life? 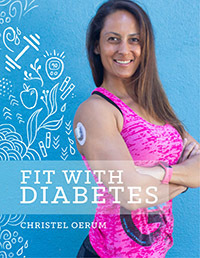 Previous Post: « Are You Living ‘For’ Diabetes or ‘With’ Diabetes? I have bought several of Walden Farms items, the salad dressings and jams are amazing. A bit expensive but worth the price $5 each where I live in Ontario Canada.